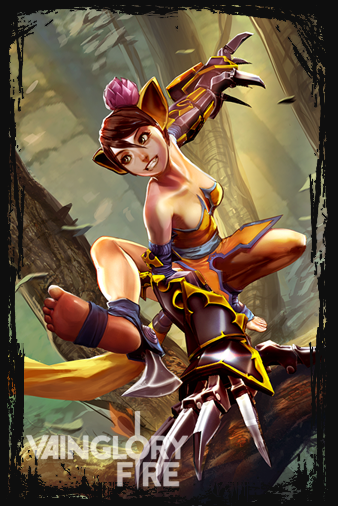 Taka An assassin like Koshka, Taka can be hard to pick off, as he can disappear, appear again, and change the tide of the battle. However, if timed right, you can pick him off fairly easy if you can pull off a quick [[Twirly Death]] right when he disappears or use [[Yummy Catnip Frenzy]] right before he uses the ability and destroy him while he's stunned. SAW Like Ringo, Saw is really dangerous, especially with his ultimate! Krul AVOID UNLESS IN A TEAM FIGHT! "They hide and I seek; that's how it should be!" Farming is the most CRUCIAL thing to Koshka's success. You need to get as much money as soon as possible in the jungle, but yet be careful of enemy junglers, because she is quite weak early game. Up until this point, you have been farming well and found yourself picking off enemy heroes when given the chance. Now, you've just gotten Aftershock, Koshka's bread and butter, and you can have a little more space to be a bit more aggressive. Make sure you also make your way to Eve of Harvest because that will also help with staying alive. Blazing Salvo will help with the cooldown, along with Aftershock and will eventually be upgraded to Tornado Trigger late game, if you are looking to go more aggressive. If not, you can sell Blazing Salvo later on. To add on, after you get the Eve of Harvest, you need to get to Serpent's Mask fairly fast to aid with her squishyness. However, under the given situation that you are struggling to survive, especially against ranged heroes, such as SAW or Ringo, or even Krul (an absolute pain in the a**), then buy defensive items sooner, such as Light Armor against weapon builds, Light Shield against crystal builds, or Oakheart if you're looking for more health and then building it up to Fountain of Renewal or Aegis. Given Koshka's low health and defensive capabilities, it will be a challenge to stay alive late game. Once you get a defensive item to complete your item set, there really isn't much to do but play strategically. Remember, burst damage is key, but given this build, there is more space to fight in longer battles with lifesteal. Tornado Trigger will help a lot to help Koshka stay alive. Not only does it reduce cooldown to use more abilities to use your crystal lifesteal, it also increases attack speed substantially which, in turn, means faster lifesteal with Serpent's Mask! I usually recommend using Fountain of Renewal with the aggressive build because the healing benefits help in tough situations, and the shield isn't too shabby. Just be careful when engaging in battles. Note how fast you can pick off an enemy hero (as well as the type of build they have) so that you know when it's the right time to go for the kill. Don't forget to use Crystal Infusion with spare gold! cooldown will help greatly! Please provide feedback and vote for this build!